with a touch of rapeseed oil. Pimento is a sweet red pepper, not a spicy one, so these olives are relatively mild and a good all-rounder. 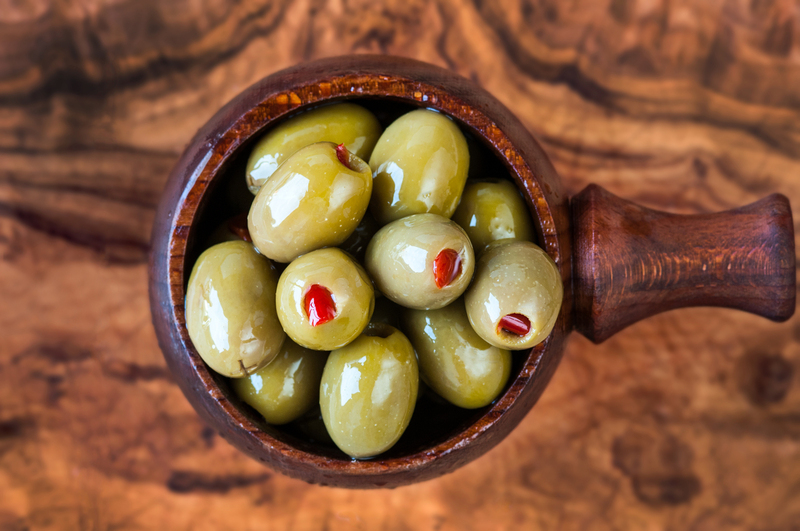 The pimento is lovely and juicy which makes these one of the more classic olives. If you have an allergy, unfortunately our products may not be suitable for you as they are produced in our kitchen where we handle NUTS, MILK, FISH, SESAME, MUSTARD and fresh garlic and herbs. Pitted Green Olives with Parsley, Tarragon, Garlic, Lemon juice with a touch of rapeseed oil. Mixed Olives with Coriander, Thyme, Coriander Seeds, Garlic, Orange juice with a touch of rapeseed oil. Volos Olives with Coriander and Garlic with a touch of rapeseed oil. Super Mammoth with Basil and Garlic with a touch of rapeseed oil. Want to keep up with the goings-on at the Borough Market? Follow & like us now! Latest news, product & offers from Borough Olives straight in to your inbox.